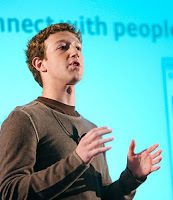 > Zuckerberg: Genius or One "Billion-Dollar" Hit Wonder? Zuckerberg: Genius or One "Billion-Dollar" Hit Wonder? Today I went to see “The Social Network” – the film based on the rise and rise of Web 2.0 darling website “Facebook”. From everything I’ve read about Mark Zuckerberg, the film is highly inaccurate, but since when does that stop Hollywood from spinning actual events into a Blockbuster. But regardless of the spin, I absolutely adored the film and it started me thinking – is Zuckerberg really the genius everyone makes him out to be? Now, there is no doubt that Facebook is a billion dollar company – and it takes both talent and luck to achieve that – but compare Zuckerberg to the “genius” of Bill Gates or Steve Jobs or even to the boys over at Google and its suddenly clear that Zuckerberg has only ever done one thing – The Facebook. Gates built Microsoft from scratch, at a time when computers weren’t popular or widespread with the mission statement “A PC on every desk and in every home”….Basic, DOS, Windows, Office, Enterprise software, and now Bing/search, mobile, XBox, Entertainment, Labs, the list is endless. Over at Apple, Jobs has a similar resume – Apple computers, the iPod, the iPhone, the iPad tablet and also Pixar and Disney, entertainment in the form of Apple TV and iTunes. Virtually disrupting the way people buy and engage in entertainment directly from beneath the companies that created entertainment companies. Finally, Google made it big by turning search into a billion dollar business off the back of advertising, but unlike Zuckerberg they have branched out in a Microsoft-esque way and gone into mobile phones, browsers, their own Operating Systems and beyond with other online entities such as YouTube, Gmail, Google Earth, etc. Which brings us back to Zuckerberg. What is next or comes next after Facebook? Is there another idea bubbling away within the young CEO’s head? (Was Facebook ever in Zuckerberg’s head or as the movie suggests, was it stolen? That’s far from me to judge and I don’t want to, he’s been credited with it already). Does there even need to be another idea after Facebook? I don’t know the answer to that question, but looking at the state of other social networks such as MySpace and the privacy, boredom, social change elements that may eventually hit Facebook at some point, to me it would seem foolish to not diversify or ride the wave of another business on the back of Facebook. One element that did impress me and even inspire me was the ‘nothing will stop me’, relentless streak – arguing over the meaning of words and holding multiple conversations by asking multiple questions all at the same time that reminded me a lot of Bill Gates trials over the Microsoft monopoly throughout the browser wars with Netscape. It impressed me. I also liked that throughout the film, in just about every scene, there was a whiteboard. I know in my job in IT, the whiteboard is my absolute best friend and its one of the most powerful tools I have at my disposal for planning ideas, keeping a to do list, etc. I have a notice board on my wall at home, I’m considering trading it in for a whiteboard – think I just might! Back to my point though, is Zuckerberg a genius? I’m waiting for the next chapter before I make my decision, so far, the boys doing rather well for himself.